TATS A KOOL CHALLENGE: Sixth Day of December! Only a day late so far, that's not bad! Gosh! you really liked my Vanilla Sky and the snowflake, thanks for all the comments, very much needed encouragement. I intended that it would be the thread that I would do all my snowflakes in this Christmas...but it took so long to get it done...and then I took on this challenge....and then I had the new batch of Rainbow Bright and the rest is history! 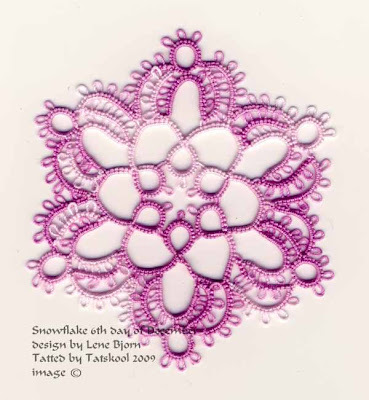 Here is my snowflake, the sixth one from 24 Snowflakes in Tatting by Lene Bjorn. Isn't that pretty. I tried to make my picots long to make it frilly. This was tatted in another of my Altin Basak collection, very pretty colour. Soft and gentle. I need time to repeat this one in Vanilla Sky. The pattern was pretty easy except that I decided to make it in one continuous go and make a split chain to go from the inner ring to the outer round. I have made so many of Jon's designs on rings from her new book...which are great practice for split chains....that I thought that it might now be easier.....and to be honest it was....but I can still see where I made the split chain. Once again I feel that I am not afraid of it! Sh1 5.25m, Sh2 4.75m...total 10m...more if I could do even longer picots. It would look nice in two colours but no time to do it. My only criticism of this book....like most of the others in this series...is the insufficient amount of written instruction and often the diagrams would be easier to follow with more info on them. This pattern was ok as is is labelled with A,B,C..to help tackle to outer round. I am now coming up to three patterns that I have not been looking forward to. I would have skipped them and gone on to the next ones that look easy. But life can't always be easy and that is the point of this challenge...to tat them all...in order. So look for me tomorrow to see if I have been able to do it...without exploding or imploding. Very pretty! I think I might have to get some Altan Basak in this color. Hi Diane,Lovely colour but the thread is awful! I will have to dye this colour. Oooh, this is my favorite so far. I like the way the picots create a solid-looking area to contrast with the negative space in the center. My copy of the book you are using came to day; and I am in awe of your tatting skills. And I love Vanilla Sky thread. I don't care for Altan Basak threads either. I agree about those books, lovely patterns but even with the visuals, the stitch numbers are too small and to crowded in places. I like those that she put arrows on so you knew which way to go. I also like patterns to show a 'start' place. I don't know if I'll be able to tat any of these snowflakes after looking at the patterns. Perhaps it's something I'll set aside and come back to in a few months and find it makes sense. That does happen! Ooh, I love that! It's amazing how much prettier something is when it's tatted in a color other than white! And I want some of that Vanilla Sky, too. I'm trying to learn some discipline, but I see that's not going to happen anytime soon. Great pattern, and I agree about the thread. I have a ball of it and will not ever get anymore! It is a gorgeous shead, though! Hi Miranda, Isn't it amazing how Design tat taught us to look at things in a different way. I like the effect too, but it does need the long picots to create mass. Hi Mica, I wonder which ones you were dreading. Hi Bev, Glad you go the book, I will be able to 'talk' you through any of the patterns and make then do-able. I did that for Diane and she got on fine. Hi Steph,They all look beautiful in the book in crisp white, wish I had time to tat them all in white. But I wanted to show how they come to life in colour. I really enjoy following your challenges, and this is no exception. I often feel I want to buy the book and tat along, but I don't have the stamina.. This is a very pretty design. Good luck with the next three. I'm enjoying all the snowflakes you are making. Plus I look forward to see what beautiful colors you will use next. Oh! Another beauty! I ♥ the color of this one as well as the pattern! You are inspiring me to give it another go at working the snowflakes from this book! OH, this one is really pretty! It's been awhile since I tatted from this book & I realized how spoiled I've gotten with better diagrams and instructions since I first got it. I started one tonight...no clue how many stitches but I could almost see the photo well enough to count but not quite, so took an educated guess. Isn't there an english translation now? Or maybe you have it. I don't. Hi Snowy, you can encourage me to keep going, not sure I have the stamina either.I have bitten off more than I can chew! Hi Carol, stay with me on my way! Hi Chic, the colour is lovely. Hi Gina, I do have the english translation, but it doesn't make much difference. But there are stitch counts on all the diagrams. Your right that one sure is a beautiful snowflake. Thanks Bonnie, It's a 'must do again' in so many diff colours that I can think of!